At The City Painters we work with both interior and exterior stucco on a regular basis. 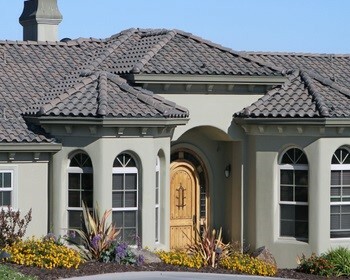 Stucco is an ancient substance that used to come in only a few earth-toned colours however today there are a variety of different paints and colour options available for painting stucco. Let our professional painters transform the look of your stucco by giving it a fresh coat of paint. Whether you want to just freshen up the look of the stucco with a fresh coat of paint or you are looking to change the colour and go for a whole new look, The City Painters can help. The outside of my house looks brand new. I am extremely happy with the work that John and the rest of the team did on our Stucco. I can’t say enough about the stucco painting job by The City Painters. They stood out amongst all of the people we received quotes from and we were not disappointed. CONTACT US FOR A FREE STUCCO PAINTING QUOTE TODAY! Painting Stucco is fairly easy to do, you just have to make sure you are using the right products. We’ve put together a few tips and tricks for your next project. Choosing your paint– Most exterior paint can be used on a Stucco surface however it looks best when it is painted using a flat paint. Ensure that you are using a good quality brand of exterior paint as well because higher quality paints tend to be more durable and resist fading. Tools– Choose your tools wisely. We always suggest using a larger-nap roller to apply paint. This will make it easier to get into the spaces and holes. Preparation– The surface of the Stucco should be as clean and dry as possible before any paint application. We always recommend pressure washing the surface to get rid of any mold or mildew prior to painting. When to paint– Always check the instructions on your paint can. Different kinds of paint can be applied in different temperatures.